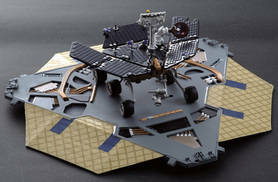 Our Mars Exploration Rover captures NASA's twin robotic explorers Spirit and Opportunity as a 1:18 scale die-cast model. Highly detailed for its size (5.24" wide across the fully-deployed solar arrays; 3.5" tall from wheel bottom to camera top), the rover's mast-mounted cameras, high-gain antenna and robotic arm are all moveable. This model's included 10" base is a replica of the rover's lander and (deflated) airbags.